I do realize that designing a website is a complex job! And this realization was reinforced recently – when I embarked on designing the new website of the National Institute of Statistics of Rwanda (NISR). Being the national statistics office (NSO), one of the primary tasks of the organization is to disseminate statistical data; and to reach wider audiences, it has to happen through all available media/channels – Print, Events and Internet (electronic). On the Internet front, NISR had a website. However, with ever expanding demands from its data users, and to capitalize on the latest developments in the internet technologies to meet those demands, NISR decided to revamp its website. The new website was to accommodate the latest advances in statistical data production and dissemination processes and at the same time, to augment the ease and efficient access of statistical data through a single entry point. Handling of statistical data is a specialized task and requires specialized tool. Therefore, it was clear from the start that, the website will be an amalgamation of different functionalities, coming from different tools – but the resulting website should be giving the website visitors a seamless experience. This understanding has steered the direction of the designing from the beginning and therefore, instead of doing the page layouts or designing the landing page first, the primary focus was on visitor’s behavior on the website and that, the design must be to support the website visitor’s flows – how visitors flow through the website. Talking about visitors, not all visitors are same. Visitors may come from different sources, with varying levels of knowledge and engagement, and with different objectives. However, it was important to identify a prioritized flow – with the potential of affecting most of the visitors. The identified flow was – a landing page and then, a clear and distinct navigational difference between accessing generic organizational information (about us, job notices, contact us etc.) and statistical data. With this aspect in mind, the website designing started. And then came up the issue of content types and their grouping! After several iterations, on statistical data front: ‘Surveys’, ‘Publications’, ‘Indicators’ and ‘Microdata’ were identified as the main groups, and on organizational information side: ‘About us’, ‘Services’ and ‘Contact us’ were identified as the main groups. These main groups now collectively support the content types of survey metadata, survey incidents, publications, stories, notices, articles and advertisements on the new website. The first two content types, survey metadata and survey incidents, create generic and specific information about a survey respectively. The publications are documents (mostly in PDFs). Stories are news and events and may include press releases, event announcements, and press coverage of NISR etc. Notices are either job announcements or procurement announcements (Tenders). Articles are statistical news items accompanied with a cover image (the image is displayed on the landing page with the link to the article). And Advertisements – which are created to persuade website visitors to specific contents (banners displayed on the landing page with appropriate links). One of the most challenging tasks was providing website visitors a seamless experience in navigating between different tools/applications. An example of successful implementation of this is the smooth transition that has been established between the website and the ‘Prognoz platform’ data tool. On the website, under ‘indicators’ group, one can see three menus items. One of them reads – Rwanda Data Portal. Clicking on this, takes the website visitor to the ‘Prognoz platform’ data tool (hosted elsewhere). However, for the user, it does not appear ‘going to another website’ as the look and feel of the Rwanda Data Portal is exactly like NISR website. 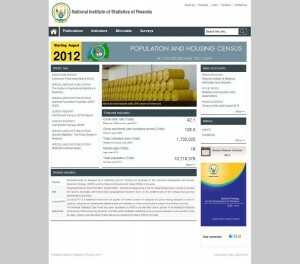 The visitor can click on any menu items on the Rwanda Data Portal to come back to the main web site. Though, the new website in online now, the work on it never finishes. It’s an ongoing process and therefore the governance mechanism around it is important to establish. In NISR, there is a Website Management Committee – headed by a senior manager, entrusted with the responsibilities clearly outlined in the Terms of Reference; also there is a panel of staff – with unambiguous responsibilities of various content types; and then finally a webmaster – who works not only as the technical focal point for the website but also as the visual editor for the contents on it. The development work on the website – giving shapes to the ideas – was done by the young and vibrant team of Tayari communications based in Rwanda. Yes, designing a website is a tough job indeed, but making it a successful one is harder. My efforts are now on to do the later!